Password Managers are one of the essential software that everyone has installed on their devices these days. They not just simplify your life by automatically storing passwords for you but also ensure proper security of your online identity. One should always have a strong combination of characters as a password to an account. But remembering these passwords has always been a challenge. So, in your quest for the best password manager, let me introduce you to Dashlane, an award-winning software. Dashlane is a quite popular tool that has been widely used by over 8 million users worldwide. It offers unmatched security and features that ease out the task of maintaining your digital identity. Dashlane consists of both Password Manager and Wallet which lets you maintain your passwords and digital identities respectively. Their semantic technology, which allows you to auto-fill forms and auto-login to all your favorite sites, is the most advanced amount all password managers. Dashlane is available in 11 languages, with app support for Windows, Mac, Linux, Chromebook, iOS, and Android devices. Now let us take a look at it in the bit more detail. Like all other password managers, this section of Dashlane lets you store usernames and passwords for different websites. You can manually add a record or Dashlane will automatically create one for you whenever you log in to a website for the first time. You can directly access these records from your browser by installing the extension available for different browsers. Just click the ‘Dashlane’ icon adjacent to the address bar or simply use the inbuilt auto-login feature to login into any website. If you really want to know how strong and secure your passwords are, head over to this section to view your security score. 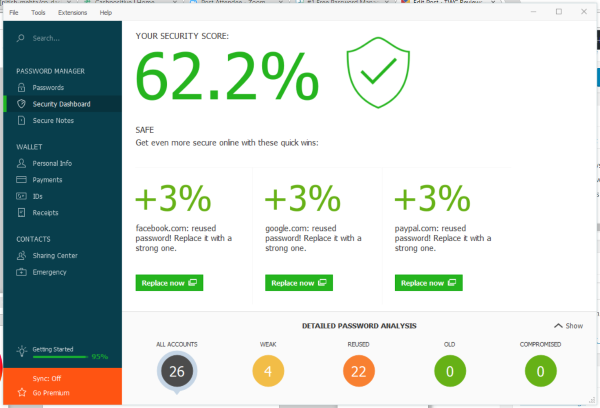 Security Score is a measure based on all the passwords that you have stored in Dashlane. 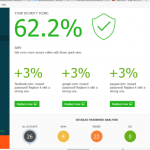 Apart from security score, Dashlane will also give you some suggestions to improve this score and get even more secure online with some quick fixes. Beneath the Security Score section is the detailed analysis of your passwords. Detailed analysis will tell you how many and which accounts have a weak or reused password. In this section, you can create notes to store any personal information in a password-protected environment. Apart from simple blank notes, Dashlane has quite a few prescribed formats for documents. For example, you take note of your license keys, memberships, legal documents, database credentials and a lot more. The thing I love the most about secure notes was that they could be selectively password protected and some of them can be left open without security. So, this was pretty much in the Password Manager part, now let us move on to the Wallet part. Here basically you can create different identities with their basic information. These identities let you skip the fuss of entering details on websites again and again. Apart from identities, you can also create addresses, company details and much more to avoid filling web forms. It will be great to see gps tracker in app.You can add as many identities, and they can also be auto-created on the go when you enter your details first time on any website. Who does like to enter the card details again and again? The payments section stores all your cards and payment details that you usually use online. 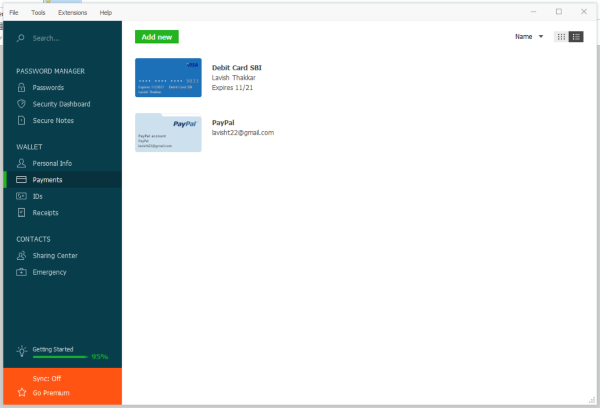 Once the card is saved, you can use the Dashlane extension to make a payment on any website using those card details. You can also save your PayPal account here to automate PayPal payments as well. This section holds all your ID cards and legal cards. You can save your passport, ID cards, social security cards, driving license here. Saving your details here save you from reaching out to your wallet every time you need these ID numbers. Also having a digital copy of your legal documents surely helps in critical situations. This is one such feature that I feel no other password manager has to offer. This section basically tracks the online payments you make and automatically saves the receipts. Now you don’t need to manually save payments receipts for all the payments you make online. This really comes handy whenever you want to review your purchases later. 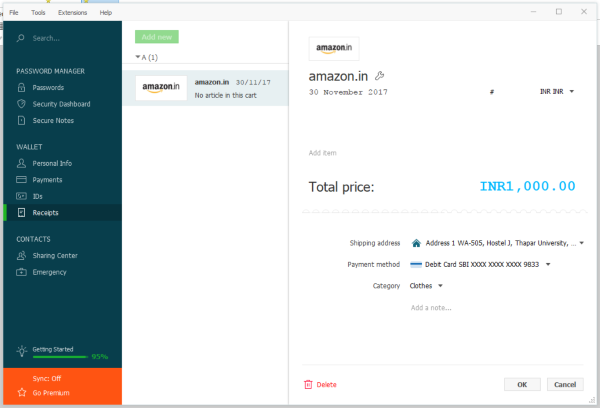 Also, it automatically caches additional information like taxation number and cart details from the payment. Sharing passwords and credentials has always created some suspicion in my mind. Dashlane’s sharing center eradicates it completely by letting a user share credentials with other people in a very secure manner. Once given access to other users, they can use these credentials to log in to the desired website. Not just passwords, you can share notes, IDs, payment information, identities or anything that you created in Dashlane earlier. Moreover, these credentials remain in sync, the changes to passwords and usernames are reflected in everyone’s Dashlane account. 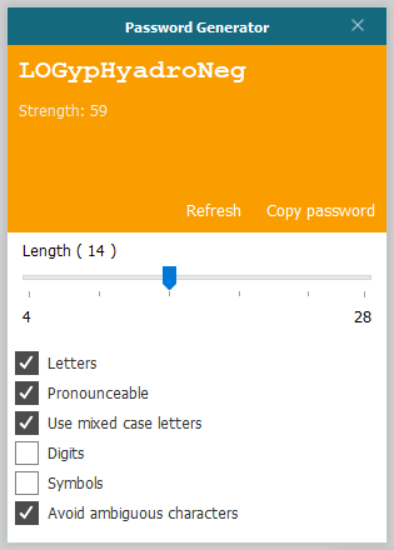 Dashlane comes with an inbuilt password generator that generates strong usable passwords on the go. One thing I liked about the password generator was the ‘pronounceable’ feature. This feature would let you generate passwords that are strong but also pronounceable at the same time. Pronounceable passwords are usually easy to remember in day-to-day situations. Apart from that, you can control the complexity of password by adjusting the slider. And you can also choose allowed characters in the password. Dashlane Password Manager is an all-in-one complete password suite that comes with all the features one can and cannot expect. It is cross-platform and has extensions available for all the major browsers. Moreover, you can even install mobile applications on your device to manage your passwords on the go. Dashlane comes with pretty nice features that are important from both security and usability perspective. Dashlane is essentially free to use, but you might want to have a look at the premium version which comes with additional features like synchronization across devices, unlimited sharing access, automatic backups and awesome support. The regular price is $199.95, but TheWindowsClub readers can get a 25% off a 5-year Dashlane Premium subscription – you need to pay a Special Price of $149.99 only. Visit dashlane.com to buy it now! DataVault Password Manager stores your confidential information on your device, not in the Cloud. DataVault for Windows is $10 for a lifetime license. DataVault Password Manager implements a Distributed Security Model to store your information on your device, not in the Cloud. DataVault for Windows costs $10 for a lifetime license.